Click on title or image to be taken to the detailed information page. 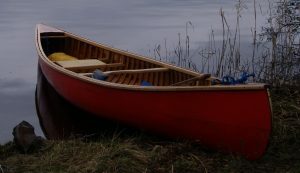 The classic Canadian canoe built entirely from timber and sheathed in canvas. Based on the traditional native American birch bark canoes and modified by European settlers to make a boat that is beautiful, robust and a pleasure to paddle. Available in 16ft and 14ft versions. Lapstrake canoes are made with overlapping elite marine ply planking, providing strength and rigidity which is further increased though the use of epoxy resin fillets along all seams and a fibreglass cloth layer on the hull bottom. The result is a beautiful lightweight boat. Available in 16ft and 14ft versions. A classic sea kayak built using traditional methods, sheathed in ballistic nylon. This boat is built on a one-off basis to customer-specific measurements. Variations can be made for high speed performance boat, rolling specific craft, ultralight expedition boat and broader-beamed day tripper. Available in both 14 and 16 ft. This is a skin-on-frame open canoe built on the same form as the shearwater. The framework consists of cedar ribs with a half planked cedar hull. The frame is skinned with high grade ballistic nylon which is then waterproofed with flexible epoxy resin. This is a lightweight with the 1ft version weighing in around 22kg. Available in both 14 and 16 ft. This is a skin-on-frame open canoe built on the same form as the shearwater. The framework consists of greenoak ribs and ash longitudinal stringers. The frame is skinned with high grade ballistic nylon which is then waterproofed with flexible epoxy resin. This is a lightweight with the 1ft version weighing in around 20kg.